In this photo, size does matter! What is a genetically modified food, really? Many people think that to genetically modify a plant means to improve it, make it more plentiful or nutritious, ripen it quicker, make it resistant to drought, keep it from freezing, etc. Some think the practice has been a part of agriculture for centuries, or that it’s the same thing as, say, hybridizing tomatoes or combining plums and peaches to create nectarines. While there are potential benefits of the technology including some of what is mentioned above, there is more to the story. 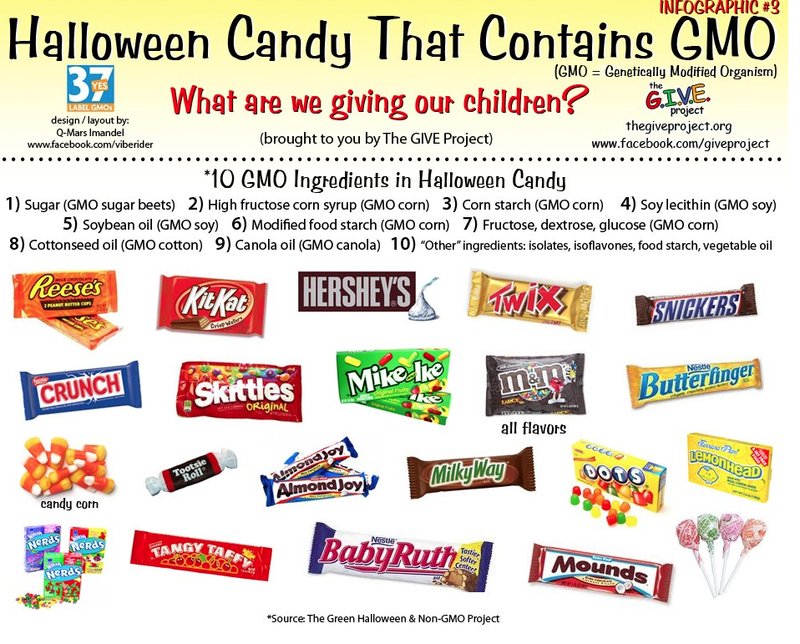 Before defining the term, it’s important to note that current figures show that 70% of food currently on US grocery store shelves has at least one and likely more ingredients derived from genetically modified crops such as corn, soy, canola or cotton. First introduced in 1994, genetically modified foods are almost as ubiquitous in our diets as salt. To genetically modify a food means, in very general terms, to insert the DNA of a foreign species into the seed or crop that produces the food – thereby changing it’s original DNA – forever. Genetic modification could also be described as forced or manipulated alterations to genetic material that would otherwise never occur in nature. The DNA that is inserted could be animal, bacteria, virus, or theoretically, anything that is alive and capable of producing the desired result. While there may be the above-mentioned and countless more beneficial uses of GMOs in agriculture, the truth is that currently, the most prevalent usage of the technology is either to create crops that can withstand treatments of herbicides like Roundup, or to enable the plants themselves to release a toxin that can kill insects that bite them. The opening scenes of this video portray a pretty realistic picture of the general public’s awareness, or lack thereof, of GMOs in our every day foods. To everything – spin, spin, spin! Having thought all along that op-ed meant “opinion editorial” – I actually googled the definition to be sure. It doesn’t mean that. It means “opposite the editorial” and non-affiliated writers write op-eds. In this case, a piece that I ran across today appears in Forbes and when I read it I was outraged. I was ready to permanently write them off as a credible news source until I learned the true definition of op-ed. So not only is it an opinion, but it is an opinion that the publishing entity does not necessarily endorse. Now onto the GMO issue and California Proposal 37, the “Just Label It” law. My reaction to this article (and I use the term loosely) was so emotional that I couldn’t just read it without doing anything. It had to be the subject of my post today. Because of the looming election, my blog has been solely devoted to the prop 37 issue and I notice that not as many people are reading, but I have to be a devotee. I am called to this cause. And hey, I don’t even live in California, but I know this will have national implications no matter which way it goes. One comment I read about this particular op-ed said that it is a perfect lesson in how to spin an issue and create propaganda. The article’s author is a former Monsanto man and the contributing doctor was the founding director of the FDA’s biotechnology department. Suspicious maybe? I’m sure they continue to be paid handsomely for their opinions and their lies. And sometimes I think people get so greedy they actually believe whatever fabrications they’re protecting. I am believing more and more that money buys scientific outcomes. In the case of this particular article, the thing that irks me even more than ignoring good science is the assertion that vast amounts of money are being cleverly veiled throughout the organic food industry and that the real “Goliath” here is the pro 37 camp. Oh, poor little biotech up against those organic food bullies. 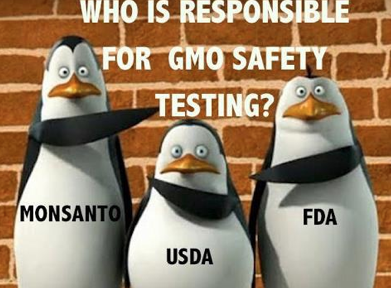 Can’t you just picture it – Monsanto, DuPont, Dow and others… meak little Davids against those meanie “just label it” wackos? After I’m done crying over the fact that people will believe the propaganda, I will have a good laugh at the absurdity of it. The yes on prop 37 effort was enjoying a 26-point lead in the poles until tens of millions of dollars were donated by the Big Businesses who want to see this proposal fail. 19 points of that advantage have recently been smashed by propaganda. Out to confuse and place doubt in voters, this effort is gaining momentum but the yes on 37 folks are not backing down. Here is an article from AlterNet that clarifies some of the confusion stirred up by the ads.